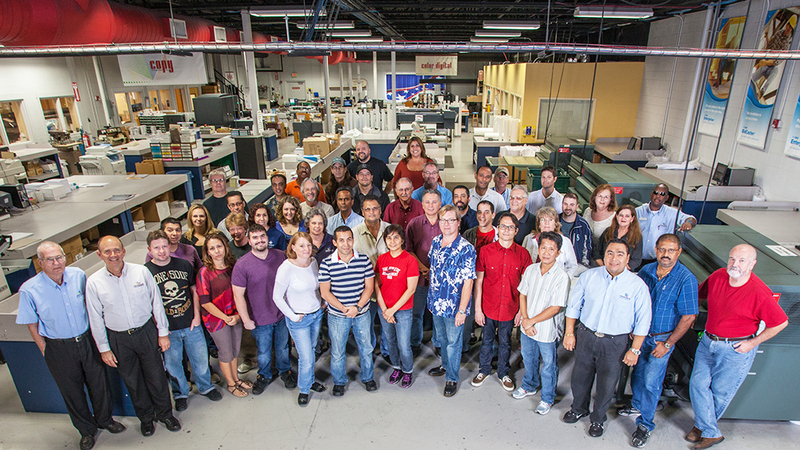 What sets us apart is our people. From your first contact to the finished job, you will find a staff willing and eager to meet your needs. Quality service is our goal, and each person who touches your job understands that and works to reach the goal of a satisfied customer. Quality workmanship, knowledgeable people and pleasant attitudes are our characteristics. We hope you will utilize all of our resources to your best advantage and consider us an extension of your team. For over 40 years Triangle Reprographics has been an industry leader, providing a variety of services to the business community. Established as a blueprinter and materials supplier to architects and engineers in 1972, Triangle has grown into a full service resource for a wide variety of clients. We strive to be on the cutting edge of technology in our field. This has led us into digital color printing in all sizes and types. 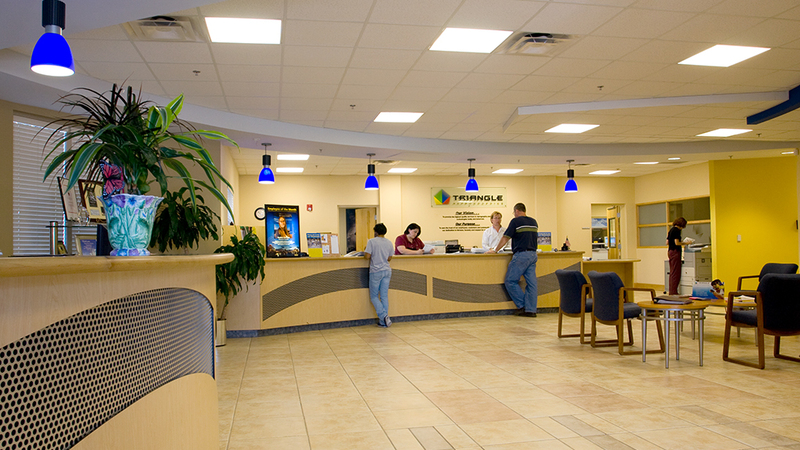 As you enter the lobby of Triangle Reprographics 43,000 square foot production facility located at 850 South Hughey Avenue, Orlando, Florida. 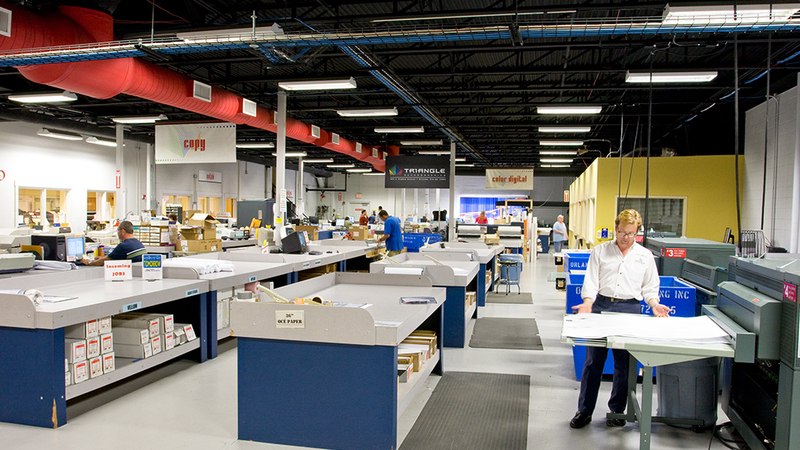 It is apparent that that you have walked into a state of the art digital printing facility. Our tradeshow displays and friendly personnel convey our dedication to technology and great customer service. 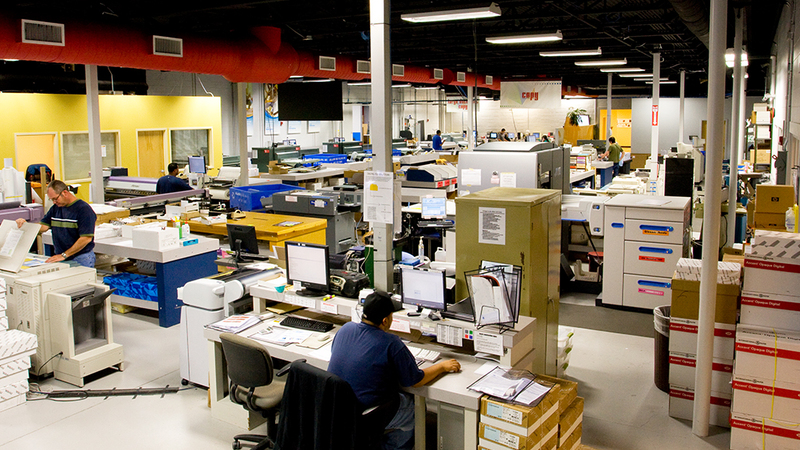 At the heart of it all, our Digital Printing and Finishing Departments occupy over 27,000 square feet of production space. We are equipped with everything needed for the production of business cards through printing and finishing a billboard sized vinyl banner; no job is too large or too small. Beginning with our Grand Format capabilities, the workhorse of our vinyl banner business is the Vutek UV printer. This monster can print up to 16 feet by 170 feet in ONE piece. Our Durst UV curable flatbed printer is capable of printing on rigid and flexible materials with a maximum width of 98" and any reasonable length with a thickness up to 1.58". Both will produce high quality signage and banners suitable for either indoor or outdoor usage. Don't need prints that large? We have an HP latex printer for color prints up to 10 feet wide, two Lightjet 430 Photographic paper/film printers that can print up to 48"x120" in a single piece, and four solvent inkjet printers that can print up to 63" wide. These platforms give us a wide range of capabilities for both indoor and outdoor signage applications. Our Small Format services include color printers/copiers for everyday color prints and copies such as graphs, charts, color reports, and other documents where color enhances the presentation. We have an HP Digital Press that prints on many different 12" x 18" stocks from transparencies to 129# coated cover weight paper. Built for short runs of 1 to long runs of 5,000 or more, ideal for business cards, full color brochures, small format indoor signage and high profile photography books. We also are equipped with multiple black and white high-speed printers/copiers and bindery equipment specifically geared for fast turn around times on manuals, booklets or documents from digital files or hard copies. Our facility has a complete custom finishing department equipped to handle any task from mounting and laminating a multi-panel tradeshow graphic to hemming and finishing a 14' x 48' billboard. We also have a digital die cutter that will cut or rout virtually any material from thin vinyl to one-inch thick acrylic or wood. Its great for life size cutouts to custom routed signage with limitless possibilities. We've teamed that up with box making software capable of creasing and cutting custom printed boxes for that eye popping presentation. We have all the equipment needed to finish every type of vinyl banner. A Miller Weldmaster 112SB used for hot air welding of vinyl materials, single and double needle sewing machines and a Hiker 307AS grommet machine for inserting grommets. For the construction management industry, another service we offer is large format construction document printing in color and black and white. We have multiple large-format printers, and our high-speed small format printers can print up to 100 specification pages per minute. We staff a cad station for processing raw files from architects and engineers, and our online Planroom provides interactive document management from inception to completion to renovation. Our Warehouse and Distribution Department expertly controls inventory and worldwide on-time shipping. Our state of the art Dispatch Control Center monitors our fleet of delivery vehicles that use the latest in GPS technology for real-time feedback and efficient, prompt local pick-up and delivery. 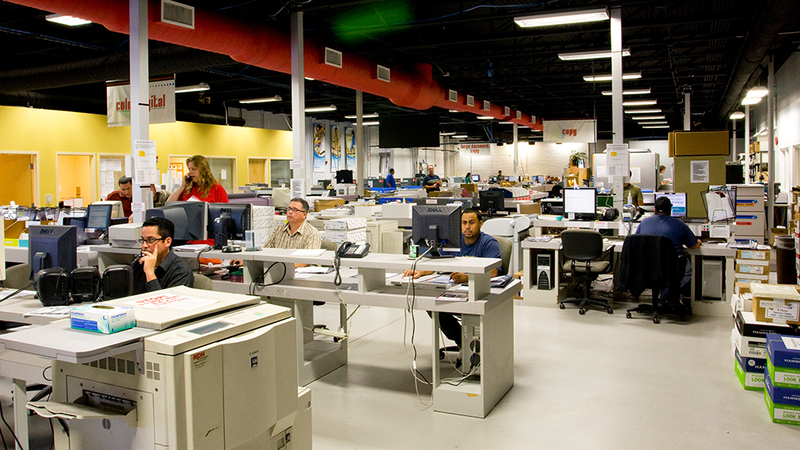 When you are in the Orlando area, we invite you to drop in and take a tour of our facility. We're sure you will see why we take pride in our services and products. Whether you're in-house or shopping online here at Triangle Reprographics we are eager to meet your digital graphics needs and exceed your expectations.